With the realm under threat and an ailment sweeping the land, the last remaining hope may come from an unlikely source—a young, orphaned servant with untested and untrained abilities. By any other name would smell as sweet;”. Perhaps that’s a question that one should ask of Dally . . . orphaned by a fire that had robbed her of father, mother, and three brothers; serving in the kitchen of the Mayor of Honor under the cruel ministrations of Krim, his wife; and yet possessed of gifts far beyond the scope of normal humans. Magic came naturally to Dally, and her abilities in far-seeing were kept to herself, for fear of superstitious reprisal. Until the fate of the realm was suddenly laid upon her small soldiers. Hyam, The Emissary, lay in the elven realm, stricken by a strange malady that threatens to claim his life. In an effort to bring healing to Hyam – and to the realm – Queen Shona risks both life and crown and travels to Honor, Hyam’s hometown. Here, plans will be made that, if successful, will bring hope and healing to The Realm. If they fail . . . The Realm will be no more. 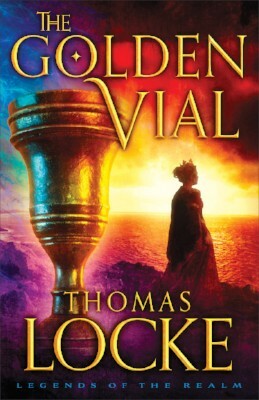 This is book three in Thomas Locke’s THE LEGENDS OF THE REALM series . . . and one that I felt in my bones must be “just around the corner,” I’ve been waiting for it so long. In fact, 2 days before I received the invitation to review The Golden Vial, I had just finished re-reading both Emissary and The Merchant Of Alyss, so I was more than prepared to “jump in” and finish this series. But . . . it’s not finished, is it, Mr. Locke?